Whilst performing Bach on the piano is hardly controversial in our rather pluralist age, it is always intriguing to hear how different pianists tackle the challenge of transposing Bach to modern instruments, and particularly how they respond to the challenges and problems presented by Bach's works. 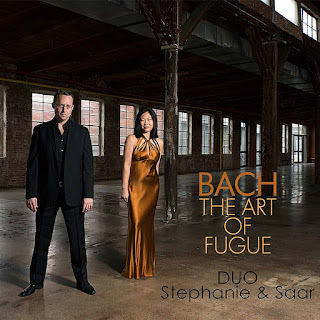 Two new sets have recently come my way, the piano duo of Stephanie Ho and Saar Ahuvia performing Bach's The Art of Fugue on one and two pianos from New Focus Recordings, and pianist Sonya Bach performing six of Bach's keyboard concertos with the English Chamber Orchestra, plus the Italian Concerto on Rubicon. Bach's The Art of Fugue is a famous problem work, not only the challenge of deciding what instruments to use in performance given Bach's lack of specification, but the fact that the work is famously unfinished. Stephanie Ho and Saar Ahuvia perform the work on two pianos, though their approach is quite eclectic, Contrapunctus 1 to 8, 10 and 11 are performed with two pianists at one piano, whilst Contrapunctus 9, 12 (recta & inversa), 13 (recta & inversa) are performed on two pianos. The canons are performed as solo piano pieces. The unfinished fugue is left unfinished, stopping mid air and the work finishes with a solo performance of the Canon per ugmentationem in Contrario Motu. The two pianists have an admirable uniformity of touch so that it sounds like one four-handed player, and their approach blends period and modern. The essential touch is modern, but there is a nice clarity to it. There is pedalling, so the result is more romantic and not as austere as some performers of Bach on the modern piano. When it comes to fugue subjects they seem to like a uniformity of tone and articulation, so that the result can often seem quite a uniform texture rather than different elements of the fugue standing out. The first two piano piece of the sequence, Contrapunctus 9, really makes a glorious noise. These are beautifully fluent performances, ideal for someone who likes quite a modern sound in their Bach, but I have to confess that I like a slightly more analytic approach to Bach on the piano with less of the modern romantic styling. This issue of style re-occurs in Sonya Bach's performances of the keyboard concertos nos. 1-5, & 7 with the English Chamber Orchestra. Using a piano in these works solves the balance problems inherent in period performances with harpsichord; too often, especially in live performance, I find myself frustrated at the way the accompaniment can easily dominate the harpsichord and wonder what forces Bach actually used. Should we view these pieces really as chamber music? But with piano, there is no such problem and Sonya Bach easily dominates and creates a very modern idea of a concerto. Sonya Bach's teachers have included Lazar Berman and Alicia de Laroccha, so we should not expect period style from her, and the performances have no conductor (the concert-masters were John Mills for the first CD and Stephanie Gonley for the second one) so Sonya Bach's is the dominant personality in the performances. Putting on the first disc and listening to the opening movement of Concerto No. 5, it was if we had been transported back to the 1950s, the speed is steady with a big sound and a very strong bass line. Sonya Bach's approach isn't completely romantic, but there is a feeling of heaviness about the performance despite some fine finger work. As the concertos progress (in the order 5, 1, 2, 7, 4,3) we repeatedly hear Sonya Bach's preference for an over-strong bass line and a tendency for the faster movements to settle at too steady tempo. Her pianism does not need this over caution, some of the movements are beautifully fluid and fluent, and the opening of Concerto No. 1 is very engaging. It made me wonder what order they were recorded in (there is eleven months between recording sessions and I understand that different pianos were used), because by the final one in the sequence, Concerto No. 3, artist and ensemble seem to have adjusted to themselves and there is a poetry, lightness and crispness to the performance lacking in the opening of the first disc. With the Italian Concerto it is just Sonya Bach on her own, and here we can hear the intelligent virtues of her style, crisp and engaging with a certain steadiness of tempo, she brings poetry to the slow movement and takes the final Presto at quite a lick. 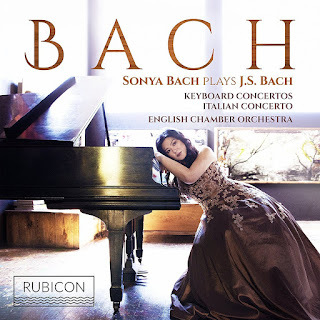 Sonya Bach's performances of the concertos seem to be very much a work in progress, and I wondered if she should have worked with a conductor to shape the overall performances, or perhaps they had been recorded too early. What Would Bach Have Done?